A Columbia University graduate with a Bachelor of Science degree in civil engineering, Walt was, like many people, destined for a career in his profession of training. In fact, immediately after graduating, he accepted a job working in the Design Division of the Port Authority Engineering department on the 73rd floor of World Trade Center One. However, within the first fifteen minutes of this his first job in corporate America, Walt, frustrated by the monotony, restrictions of nine-to-five employment, realized beyond the shadow of a doubt, that he absolutely hated it!It was several years until he was able to grow his sideline business in the music industry--a personal passion--and walk away from his career to become a full-time "passionpreneur." 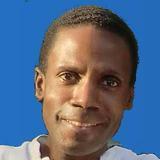 He authored several books on the music industry, created a brand of inspiration called "Life Rhymes," and launched dozens of websites, and unique products.As he honed his experience and expertise in website development, internet marketing, creating the life of his dreams, and living true to himself, he developed a unique "Passion Profit Philosophy and Formula" and a coaching practice to help others do the same. In 1999, he published the formula in Turn Your Passion into Profit which, with yearly updates (like this one), has consistently sold in the top 50 in home-business books on Amazon.com.A few years later Walt booked a one-way ticket, escaped the rat race to live out his dream of being a "nomadpreneur. "Walt currently owns and operates dozens of websites, has written a total of 20 books, over 400 articles and over 500 motivational poems. He has been an artist manager, radio deejay, record label owner, inventor, poet, network marketer and consultant. He has written for Entrepreneur Magazine and Black Enterprise, and has been featured in Time Magazine, Wall Street Journal Online, the Dallas Morning News, The Kip Business Report and numerous publications and websites. Walt is originally from the island of Jamaica, and now lives a vegan lifestyle on the island of Saipan.You may contact Walt by calling (646) 481-4238 or via email at Walt@saipanliving.com. The Secret Formula for EVERYTHING! Walt offers phone coaching to help you discover your purpose, find your passion, create a product and market it for profit. "Value No One Can Match"
To get started, visit the www.passionprofit.com site and click on "cycle of Success" in the sidedbar. This will give you an overview of Walt's Philosophy and Formula. Then take the Passion Personality Test and discover if you are a creator, savior, guru or guide. Then order Turn Your Passion Into Profit, or sign up for Walt's one-on-one coaching.